The lights look great. This review is more towards the customer service of TST. I had an issue with the flasher relay not being automatically included since with the Grom it IS a necessary part. I wasn't aware of that and only ordered the blinkers that didn't end up blinking because of the missing part. I reached out to TST and they responded to me within hours. They not only changed their entire page to make it loud and clear to future customers that the flasher relay is necessary they also refunded and I think even upgraded my shipping since I had to order the relay separate. The price points here are fantastic and their customer service is on point. It's very rare to find a company who actually listens to their customers and then does something about it so quickly. I'm beyond impressed. Disadvantages: Wish there were running lights but the description clearly states these won't. Great product and shipped fast! Although I wish there was a washer of some kind on the back side and wish the running lights could be incorporated into the functionality. But it definitely looks a lot better than stock and is very bright! This was a simple install. I watched the video a few nights ago, and changed out the stock lights from memory. 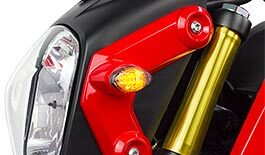 Aesthetically, these low profile turn signals soar over the stock lights. Fantastic price point, too. I love the way these look on both my Grom's. Easy to install and super bright. Advantages: Makes the front of the Grom look so much better. Just got my flush mount signals on my 2018 Grom today. They look great on the dark grey of my bike. TST is on point with their shipping and service and will see my money again! These LED turn signals are awesome! Super bright and looks a lot better than the big bulky factory ones. Installation was very easy and only took about 20 minutes. Be sure to order the harnesses and flasher relay. Shipping was extremely fast as always. Thanks again TST! . Amazing product and quick delivery to the uk, great price and great service.